Limit 3 copies of None Return in the victory display. Response: After a non-unique enemy is destroyed, add None Return to the victory display to add that enemy to the victory display. Response: After another hero is declared as a defender, exhaust Dori to add his Defense to the defending hero's Defense for this attack. Attach to a location. Limit 1 per location. Response: After attached location is explored, the first player adds 1 resource to each of his heroes' resource pools. Action: Reduce the cost of the next event that has a Valour trigger you play this phase by 2. Valour Action: Search the top 10 cards of your deck for an event that has a Valour trigger and add it to your hand. Shuffle your deck. Limit 1 per deck. Response: When this stage is defeated, each player may choose and discard a non-unique enemy engaged with him. 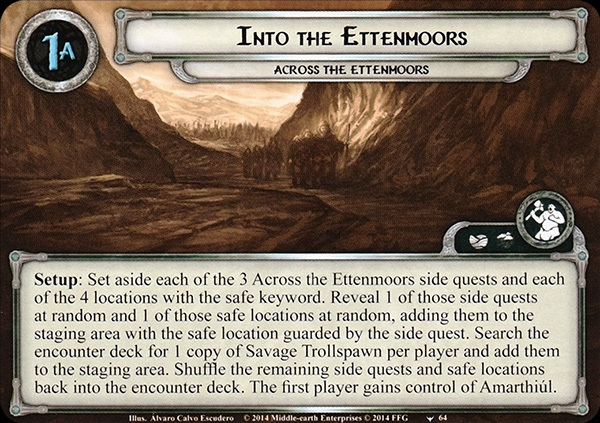 Setup: Set aside each of the 3 Across the Enttenmoors side quests and each of the 4 locations with the safe keyword. Reveal 1 of those side quests at random and 1 of those safe locations at random, adding them to the staging area with the safe location guarded by the side quest. Search the encounter deck for 1 copy of Savage Trollspawn per player and add them to the staging area. Shuffle the remaining side quests and safe locations back into the encounter deck. The first player gains control of Amarthiúl. Forced: At the beginning of the quest phase, if there are no encounter side quests in play, discard cards from the top of the encounter deck until a side quest is discarded, reveal it, and add it to the staging area. 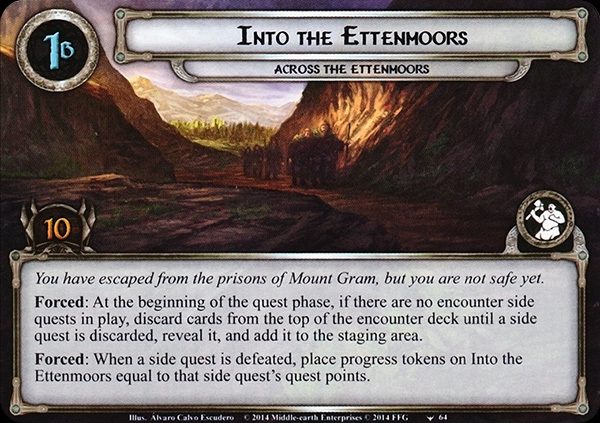 Forced: When a side quest is defeated, place progress tokens on Into the Etternmoors equal to that side quest's quest points. When Revealed: Shuffle the encounter discard pile into the encounter deck. Discard cards from the top of the encounter deck until a side quest is discarded. Reveal that side quest and add it to the staging area, if able. Reveal 1 additional encounter card during the quest phase unless there is an active location with the safe keyword. Each damaged character gets -2 Willpower unless there is an active location with the safe keyword. 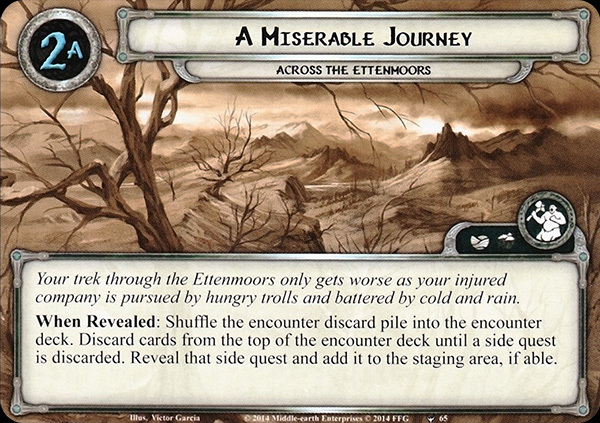 If the players defeat this stage, they have escaped the Ettenmoors with their lives, and win the game. Immune to player card effects. Response: After you travel to Secluded Cave, each player draws 3 cards. Immune to player card effects. Response: After you travel to The Hoarwell, heal 1 damage from each character in play. Immune to player card effects. Response: After you travel to Abandoned Camp, each player may return 1 card from his discard pile to his hand. Savage Trollspawn gets +1 Attack for each damaged character the engaged player controls. Shadow: Attacking enemy gets +1 Attack for each damaged character the defending player controls. Ruthless Hill-troll gets +2 Attack and +2 Defense while it has 3 or more damage on it. 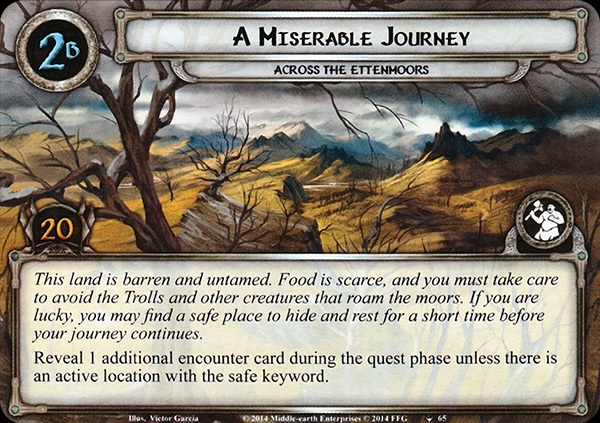 While Troll-fells is the active location, Weather cards gain doomed 1. When Revealed: If Troll fells is not revealed guarding a safe location, search the encounter deck and discard pile for a location with the safe keyword and attach it to Troll-fells, guarded. Shuffle the encounter deck. While Barren Moorland is in the staging area, it gains: "Forced: When an ally enters play, you must either exhaust it or deal 1 damage to it." Travel: Deal 1 damage to each exhausted character. Forced: At the end of the quest phase, if no progress was placed on Lie Low this round, each enemy gets -20 engagement cost until the end of the round. Response: After this stage is defeated, choose an enemy in the staging area and shuffle it into the encounter deck. Forced: After 1 or more resources are spent from a hero's resource pool, deal 1 damage to that hero. Response: After this stage is defeated, heal 1 damage from each hero. The cost to play each player card is increased by 1. Forced: When this stage is defeated, search the encounter deck and discard pile for a Troll enemy and put it into play engaged with the player with the highest threat. Each player may play a card from his hand, at no cost.